Welcome to another of our Friday Fluff Addict posts! Each week we feature a new mom, one who's hopelessly addicted to cloth diapers, and we share her story through a series of interview questions. This week we're interviewing MommieV! Tell us a little about yourself, where you are located, how many kids you have,little ones in cloth, etc.- I am a single mother of a beautiful little girl. I live in Southern Indiana and I am a college professor. My daughter is 16 months old, and we have been using cloth diapers full-time since she was about 2 months old. On my Blog, My Little Slice of Mommie Heaven I go by MommieV! What made you decide to give cloth diapers a try? I like the idea of reusable diapers because I don't like the thought of disposable diapers sitting in a landfill somewhere. I thought they would be better for my daughter, I thought I could save some money, and I thought I could save the planet, all by using cloth. What were your friends and family's reaction when seeing the "new" cloth diapers and have they been supportive or skeptical of your choice to use cloth diapers? Everyone that has seen them has thought they were really neat. My mom was the one I was most worried about, but she was very supportive of my choice to use cloth diapers. One advantage to being a single mom is that you don't have to convince a husband or partner to use cloth! What was your very first cloth diaper? I tried everything at first! 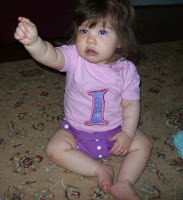 The very first one I ever put on her was a custom-made preemie sized AIO I bought from a woman on Hyenacart. I had ordered it from a laptop while on bedrest in the hospital, when I found out she would be early - and small! I ordered it custom to match her "going home" outfit. 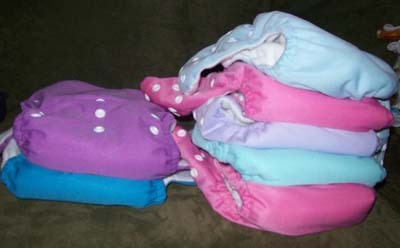 When we started cloth diapering full-time we were using prefolds and covers primarily, but I also had some fitteds. When she started daycare at 9 months old, they wanted to use a "one piece" diaper, so that gave me an excuse to buy more pockets! What type of diapers does your stash primarily consist of; pockets, aio, onesize, prefolds, flats, hybrids, etc.? We started with a stash that was mostly prefolds and covers. I still have a good stash of prefolds and covers that we sometimes use on the weekends, and I have a stash of fitteds that I use under woolies in the winter. But right now the majority of my stash is pockets. What is your favorite Knickernappies product or which Knickernappies product are you dying to try and why? I'm divided here. I started with the Knickernappies sized pockets in size M when she was just getting to that size. She is very petite, so it is likely that she will potty learn out of this size. The sized pockets are just so trim and look great on her. However, I like the OS pockets also. I like that if she does get alot bigger that one diaper will accommodate different sizes. But I guess if I had to pick, I would say our sized Knickernappies pockets. Do you have a favorite place to hang out and talk or learn about cloth ; a blog, message board, facebook page, etc.? I talk about cloth diapers all the time on my blog - My Little Slice of Mommie Heaven. I have a series of posts called Cloth Diapering 101 where I try to introduce mamas interested in cloth into the basic ideas about cloth diapers and some of the things that I have learned firsthand. But I also have done A Day in Cloth, and sometimes I just write about different things related to using cloth diapers. I have also posted photos of my daughter's naked behind when she takes her diapers off - she will hate me for that when she is older! In the past I have hung out on the Diaperswappers forums alot, but I haven't had as much time to do that recently. What cloth diapering item, besides diapers, do you consider to be a must-have accessory? Wet bag. Definitely. I dunk-and-swish, so I've never had a diaper sprayer, and it's never been missed. If you could share just one tip with someone who is just starting out with cloth or considering using cloth, what would be your best piece of advice to them? Think about why you are interested in cloth diapering, or what you expect to get out of it. Your expectations will help you to decide what kind of diapers to look into. If you want to spend minimal money and be really frugal, you will probably shop for different diapers than if you want all organic fabrics for your baby. So knowing what your goals and expectations are will help you to navigate all the different choices. *We'd like to thank MommieV for contributing and sharing her story! Please stop by and visit her over at her Blog My Little Slice of Mommie Heaven, she's got some really informative posts. Are you interested in being our next Featured Fluff Addict? Visit our FaceBook Page and check the Discussions Tab for more info.